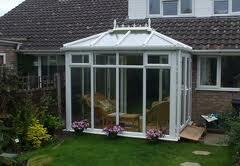 A conservatory is an extension or room that is usually attached to one side of the house using glass roof and walls. It is known by other names including greenhouse, sun-room, and solarium, among others. By UK standards, a structure is considered a conservatory if at least half of its side wall area is glazed and at least three-fourths of its roof is glazed with translucent materials such as glass or poly-carbonate sheeting. The first known English conservatories were made during the 16th century. They were owned by rich landowners who started cultivating citrus fruits which only normally grew in warmer regions such as lemons and oranges. For places that have cold climates such as England to enjoy tropical plants and flowers, there is a need to provide for the right environment through conservatories. Conservatories eventually served other purposes such as venues for tea parties, breakfast areas or simply covered areas in gardens. Modern conservatories are used to provide additional living spaces for many family homes. Early English conservatories had ornate Victorian structures. More practical but equally beautiful versions are offered by diy conservatory suppliers. This makes it possible to build one’s own conservatory with minimum fuss and at a lower cost. Customers can order straight from manufacturers. The peak of conservatory building in England was during the 19th century. Construction of new ones stopped when World War II erupted. Some of the more prominent English conservatories include the Kew Gardens in Southwest London, the Chatsworth House in Derbyshire, the Eden Project in Cornwall, the Sym House in West London, and the Barbican Centre in Central London. The renewed interest in Victorian-style conservatories was seen during the 1970s and smaller versions for domestic use was widely developed using insulate glass . From then till now, conservatories are beautiful additions to any home.